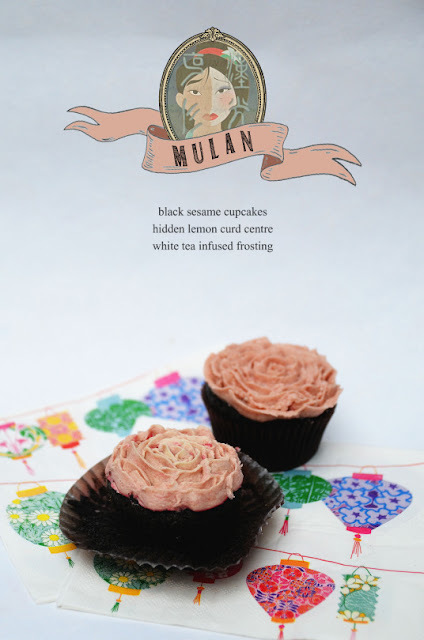 EAT: 'Mulan' Cupcakes. / papillon. I’ve been planning a line of elegant Disney Princess-inspired cupcakes for ages now, and it’s taken this long to make something I’m happy with. The black sesame and lemon combo is from Sprinkle Bakes, but I knew I would want it to be vegan; the tea-infused frosting took several attempts to get right (I tried infusing the butter in a basic buttercream, then a sub-par flour frosting with soya spread, then a fabulous flour frosting which involved coconut oil and brewing the tea in scalded soy milk). I’ve also made it with jasmine tea, but used white tea here. The vegan lemon curd is from here, but I added extra lemon zest cause I generally like a sharp lemon flavour - in retrospect this was too sharp with the fairly delicate cake and frosting, and I’d tone it down in the future. The cake itself is a smoky, adult flavour that I really enjoyed, and the tahini here has the dual effect of both flavour and moisture, for a really nicely textured cake (still good on Day 3, by the way, which most vegan cakes would not be).